If you are recruiting on an account alongside other team members (including as part of a national program or as a host site for an intermediary service year organization), here are a few different tips and filters that will be helpful to get set up and navigate the platform. Request access to join your organization. When you request access to join the organization, all existing admins on that account will receive a notification letting them know that you have sent a request. As soon as they approve your request, you'll receive an automatic update, and will be able to navigate to your organization dashboard. Listing Name: When you publish a new listing, you'll be able to add a listing name. Make sure to use a practical name for your listing, as it will be publicly searchable, and can also be a way for you to identify your listing when reviewing candidates and going back to make edits to it. As an example, if I am recruiting for a listing at a national organization named "A+ Tutoring" and am responsible for recruitment in Maryland, a name I might give my listing is "A+ Tutoring-Maryland." Point of Contact: In the second section of your listing, you'll assign a point of contact for the listing. Make sure to assign yourself as the point of contact. This will ensure that notifications relating to the listing are sent to you, and will allow you to easily navigate back to your listing in the future. Once you've saved that info, you can complete the rest of the information to publish your listing. Check out our Recruitment Best Practices for extra guidance as you create your listing. If you are returning to a listing you have previously created to make edits or view your listing summary page, you can utilize filters to quickly navigate there. By selecting the "Filter" button on your Listings page, you can filter the listing results so that only listings where you are the point of contact are displayed. Additionally, you can also use the search bar on this page to find your listing. 1. "Corps Members Section" of your dashboard: The "Candidates" tab in the Corps Members section of your dashboard includes all candidates who have applied to a listing for your organization. You can filter your view of this section so that you are only seeing candidates who have applied to one of your listings. 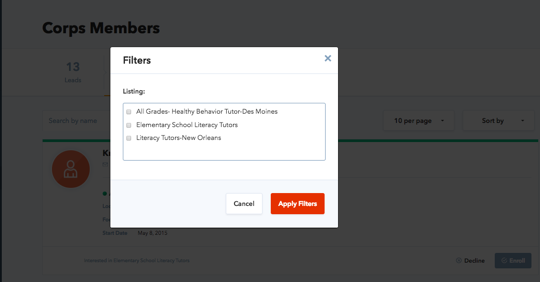 Select the "Filter" button on this page, which will allow you to filter the results based on the listing(s) a candidate applied to. 2. Your Listing Summary page: Alternately, you can also go to your listing summary page to view every candidate who has applied to your listing. You can get to your listing summary by going to your "Listings" tab, finding your listing by filtering (based on your name as point of contact) or searching for it, and clicking directly on the name of your listing. Check out our "Reviewing Applicants" article for more details on following up with candidates who apply to your listing. If you recommend your listing or save someone as a lead, they'll be added to the "Leads" tab in the Corps Members section of your dashboard. To quickly view individuals you have recommended a listing to or saved as a lead, you can apply a filter based on the team member who recommended the listing or saved the lead.